A story of seduction, passion, infidelity, jealousy and murder. The essential ingredients of a good crime thriller. But what about an opera? Surely an opera with such themes would be scandalous! Well, such an opera does exist, and, yes. when first performed it was quite the scandal. This opera was Carmen. Carmen is an opera presented in four acts. (I intend to replicate this four act structure for my Carmen blog series, but more on that later). The opera was composed by Georges Bizet, a French composer. The libretto of Carmen was written by Henri Meilhac and Ludovic Halévy, The libretto is basically the text portion of an opera. The libretto for Carmen was based on a novella of the same title by Prosper Mérimée. 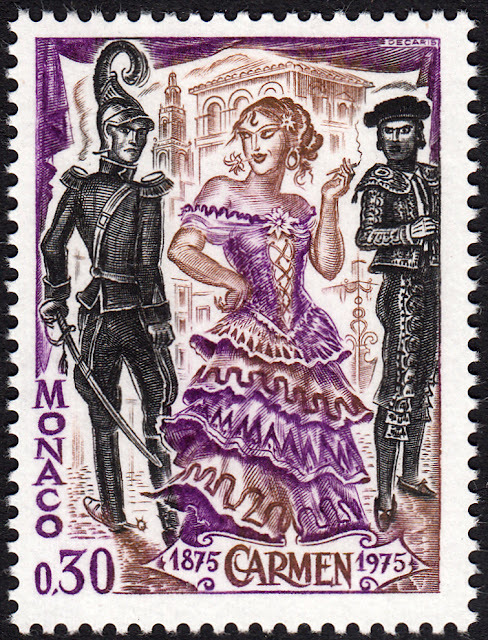 Carmen was first performed at the Opéra-Comique in Paris on 3 March 1875. The reviews and audience reactions were far from positive. In fact, the opera was more popular overseas. and it wasn't revived in Paris until 1883, eight years after its initial release. So what was this seemingly controversial opera about? The story is set in southern Spain, and it focuses on a young soldier by the name of José Moralès. At the beginning of the story José seems happy; he has a steady job, and he is sharing his life with his childhood sweetheart. That is until Carmen enters the picture. Carmen is a gypsy with fiery passions. She seduces José, who falls for her charms. Unfortunately like many love-struck young men in stories, he abandons his life to be with Carmen. But Carmen is just using him. She in turn abandons José and turns her attention to an attractive toreador, Escamillio. 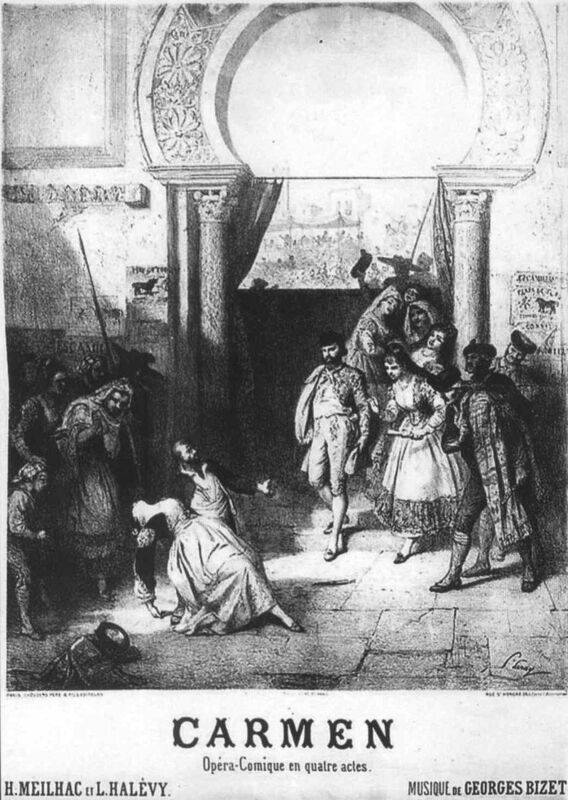 In a fit of jealous rage, José kills Carmen. If he can't have her love, no one can! Carmen's tragic death actually takes place on-stage. Slaying your main character is a risky strategy. Probably one of the main reasons for the lack-lustre reviews upon its premiere in 1875. The lights come on. We are in a square, in Seville, Spain c.1820. To the right, we can see a door to the tobacco factory. To the left, we see a guardhouse. And at the rear of the stage there is a bridge. There is a small group of soldiers standing about, chatting with each other in the square, while waiting for the changing of the guard. A woman approaches, named Micaëla. She asks after José Moralès. They tell her he will arrive with the change of guard. She leaves, promising to return later. Then the new guard arrives, and with them José Moralès. Shortly after this the cigarette factory bell rings, and a large group of young women emerge. One of the women is Carmen. She approaches the soldiers and starts singing L'amour est un oiseau rebelle (Love is a rebellious bird). A song designed to inflame their passions. Many of the men start begging to be her lover. José Moralès is not one of the men. But she chooses José Moralès by throwing a rose at his feet. He is annoyed with her and doesn't respond. If only he had stuck to his guns! When there is a sudden commotion at the cigarette factory. An officer emerges with a very angry Carmen. He tells José that she attacked another woman with a knife. Carmen cries out, "Coupe moi. Brûle-moi!" (Cut me. Burn me). José is ordered to bind her hands and take her to the prison. After everyone leaves, Carmen seizes the opportunity to sing to José about what it would be like to spend a passion-filled night with her, He is bewitched by her. Spellbound, he unties her bonds. Then she pushes him to the ground, throws her head back in laughter, and runs away. Poor José is then arrested for dereliction of duty. Now we come to the stamp. Decaris has captured the theme of Act I beautifully. In the background we can make out the sets. The factory. The guardhouse. And the bridge. 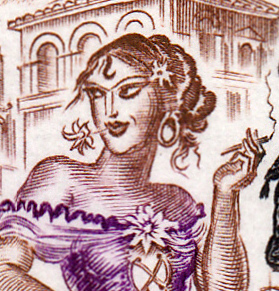 In the foreground we see Carmen flirting with José Moralès. She is smoking a cigarette to suggest of being a worker in the cigarette factory. And if we look closely we can see the rose in Carmen's mouth, ready to be thrown at José's feet. 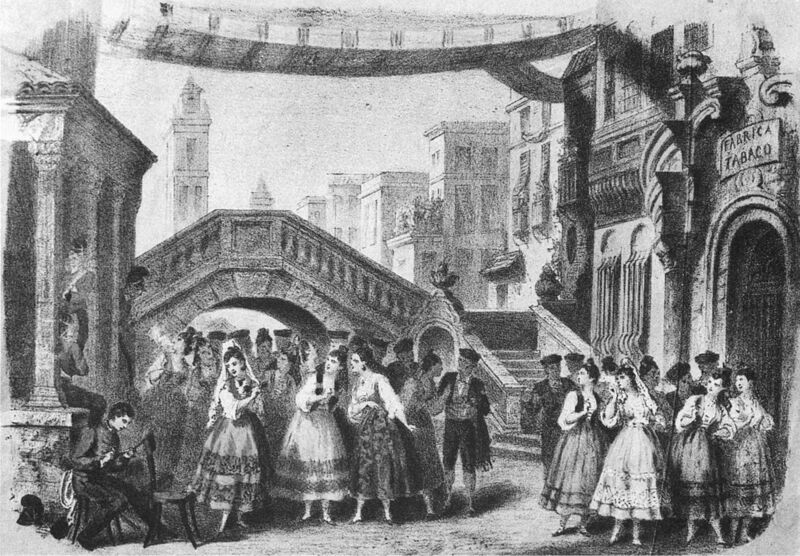 And despite the fact that the toreador has yet to enter the story, Decaris has decided to depict him off to the right, looming, yet to be engaged. But he is there. A reminder of the love triangle to come. Stay tuned for Act II next week!